Fair enough. I haven’t used it for years. And I don’t like it. Which means I’m predisposed to seeing signs of decline when they don’t exist. But Facebook’s latest results at least give me some evidence to work with. For the past few years I have been seeing lots of anecdotal evidence that less and less people are using Facebook, the world’s big daddy of social networks. Its results for the fourth quarter suggest that my anecdotal evidence is suggestive of a wider trend. 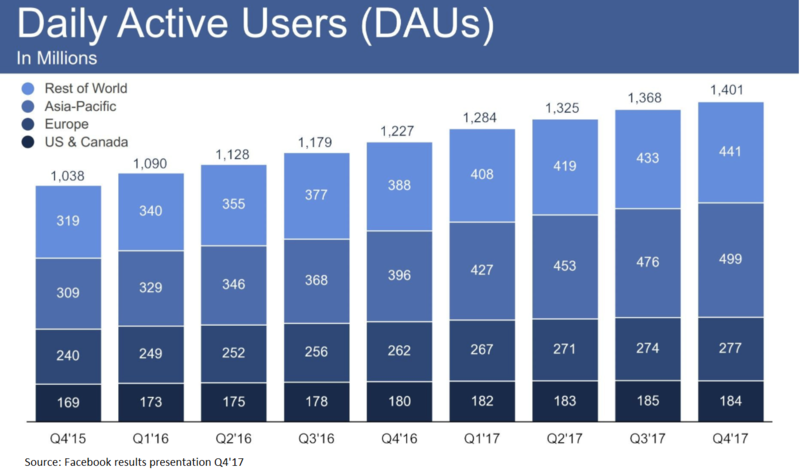 Daily active users in the USA and Canada, Facebook’s most mature market, declined for the first time in Facebook’s history. Time spent on the site was down by an average of 50 million minutes per day. That’s not much, given more than 1.4bn users a day, but it is a decline nonetheless. The question is whether this data is a blip or a sign of decline in this wonderful business. Mark Zuckerberg, founder and CEO, suggested changes made to the news feed to “show fewer viral videos to make sure people’s time is well spent” were at least partly to blame. Facebook investors have a few things to worry about. One is that people simply get tired of it. That has been the main reason cited amongst my small sample of leavers, ranging from teenagers to the middle aged. They are sick of it, bored of it and have realised they are wasting a significant part of their life and making themselves feel crap for the trouble. Two is that social media is fragmenting. Instead of one giant social network, people seem to want silos. Strava for exercise, Instagram for photos, Tinybeans for baby photos, Linkedin for professionals and Bumble for …. well … I’ll let you look that one up. Facebook and Google have taken 80% of all online advertising growth in recent years, but advertisers are finally waking up to the fact that users are spending their time elsewhere. Share prices of both Twitter and Snapchat rocketed last week on rapidly growing advertising revenues. Why should they make all the profit? And then there is the potential for growing distrust and resentment to turn into regulatory problems. One interesting potential application of blockchain is to allow people to safely own and store their online data. Say what you will about Bitcoin, nobody has been able to hack it despite the billions of dollars of reward on offer. Imagine if, instead of storing all of your data on Facebook’s servers, you store it on your own blockchain and allow Facebook the sections of your data they need. You could get paid for the advertising dollars you generate. And the day you decide to leave, the data goes with you (I pinched this idea from an excellent artice, Beyond the Bitcoin Bubble by a much smarter Steven Johnson). Most people don’t care enough to deal with the hassle. But in aggressive consumer protection jurisdictions like the European Union, governments might force the issue. Still, the reality is that for now the overall business continues to grow. Compared with a year ago, the number of active users worldwide grew 14% in the fourth quarter. 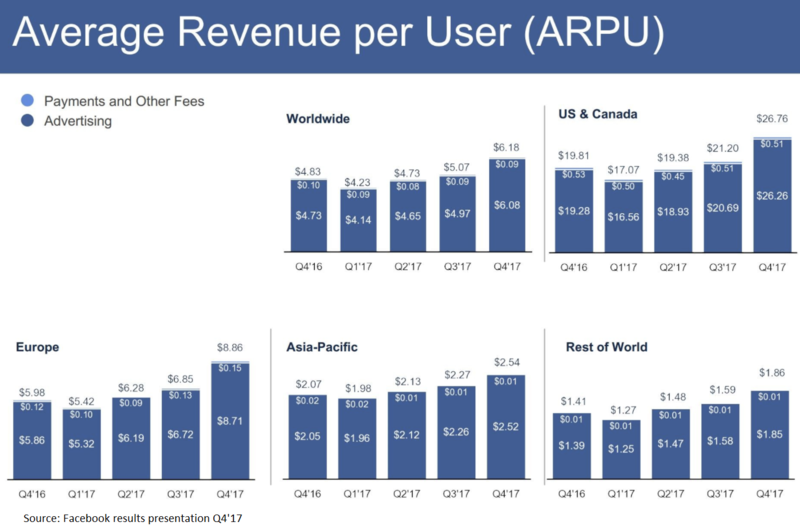 And the revenue generated per user grew 28%. The average remains a small fraction of the $26 per user generated in North America, suggesting that the rest of the world can grow a lot further from here. You would be braver than me to bet against it. For the first time in Facebook’s history, though, there are signs that its fortress might not be impregnable.